For many years there have been concerns over brick-and-mortar stores not being able to stay competitive with online shopping and ecommerce, but that may all be changing as more retailers start to recognize the need to meld online with physical stores and use technology to enhance the in-person consumer experience. But online and in-store shopping are two very different experiences so for retailers that ‘melding’ isn’t always easy. At NRF 2019 ITBusiness.ca sat down with Rob Garf Salesforce’s VP of industry strategy and insights for Commerce Cloud about the changes he has seen happening in the retail space and some ways cloud technology is helping to bring together online and brick-and-mortar. He argues that over the next 12 to 24 months we’re going to hear a lot more about the idea of store transformation. There are two major changes that Garf says he is already seeing; one, giving store associates the tools needed to offer personalized and immediate service and two, embracing the idea of the showroom. It’s about the check-in process and not just the checkout process according to Garf. Retailers need to be arming store associates with the tools needed to approach shoppers early on in the process to create a personal experience. “And that’s just as much a change in tech as it is a change in operating philosophy,” he argues. According to Alex Drinker, VP of marketing for Shinola, in a video from Dreamforce 2018, starting out the company included handwritten notes with each online purchase and when it came to its brick-and-mortar it wanted to bring that type of customer care into its physical stores as well. 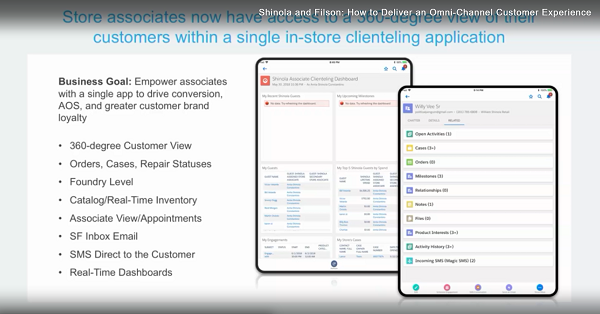 Apparently, in-store associates still write those handwritten notes but Shinola also uses technology like Salesforce’s service and marketing clouds to create personal shopper experiences. It tracks customer behaviour and collects data on in-store and online visits as well as purchases to help better understand each specific shopper. For example, sales associates will be equipped with iPads and as shoppers to fill out a profile that lets Shinola connect with them in the future, sending relevant marketing material and more information about Shinola itself. “We empowered [sales associates] to do what they do well and this [tech] sits behind the scenes and makes it possible,” Drinker says in the video. He notes that with brands like Shinola, purchases are almost an investment and even if shoppers don’t make the purchase right away these tools allow the company to reach out and continue a relationship in a personal and intimate way. And when that shopper inevitably makes a purchase, even if it’s online instead of in the physical store – because Shinola was able to collect data – it can attribute that sale back to the brick-and-mortar store the shopper may have walked into originally. The second trend is the showroom, but the idea of the showroom itself isn’t exactly new; furniture and eyewear companies have long operated on this concept of keeping the store simple, not full of inventory and bringing in items as needed. Garf says he is seeing more retailers getting rid of the old philosophy of ‘stack them high and let them fly’ and embracing the idea they might not need to have all the inventory on hand. 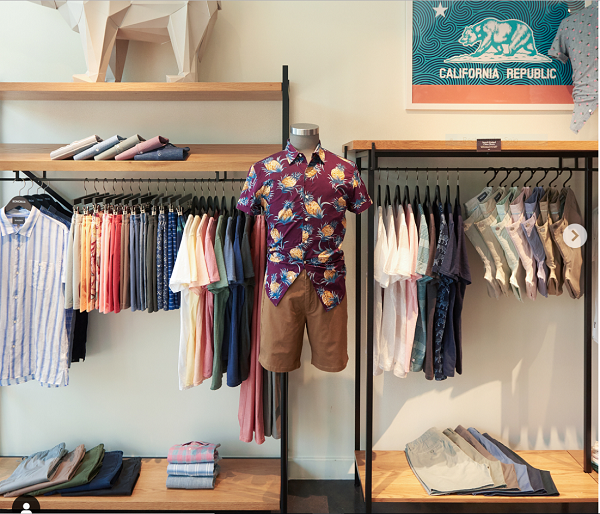 Clothing retailers like ModCloth and Bonobos are two examples of online brands that have embraced the idea of brick-and-mortar stores but created showrooms offering product samples and allowing store associates to focus on the customer experience rather than the products. With these changes, however, come challenges. When it comes to working with a showroom model, for example, it means a shop needs to more easily understand its inventory across its supply chain. This is where companies like Salesforce, Oracle and SAP come in with products like enterprise-focused cloud software services that attempt to offer a single solution that allows both non-digitally native and digitally-born retailers to create these online, tech-savvy and in-store shopping experiences. And while enterprise clouds themselves are not necessarily new, what is newer is this idea of creating a unified online and physical shopping experience through the cloud. “What we recognize is that it’s not all about a having a system that supports consumers going online to a website or platform, rather it’s about creating a system that supports a platform going to where the consumers are,” Garf tells ITBusiness.ca. He argues that Salesforce’s Commerce Cloud, which came out of its acquisition of Demandware in 2016, allows retailers to have more control and flexibility over the online and in-store digital experiences that are changing retail. Noting Salesforce’s recent announcement that it has expanded the API capabilities on its Commerce Cloud, Garf argues that applications like Einstein recommendations and visual search will make it easier for retailers to create a seamless experience across online sites, apps, social networks and of course in-store. The San Francisco-based software company is working off what Garf called an API strategy to make its cloud services more accessible. It offers B2B and B2C options that covering almost everything from sales, marketing, commerce and service. “It was all about just opening our platform through an API strategy and it’s really resonating,” Garf claims, noting that both legacy brands and younger companies seem interested in this approach. “The legacy brands are sitting there saying ‘we need to rethink about our business both technologically and process wise’ and then there are the digital natives that grew up in this mentality already but are now opening up more and more stores and thinking about how the digital experience transcends,” he says. Other major software companies, of course, offer similar cloud services for commerce and retailers. 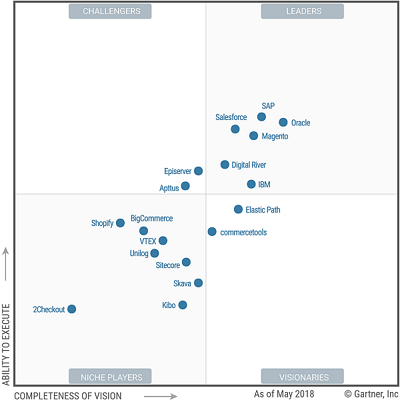 According to Gartner’s ‘Magic Quadrant for Digitial Commerce’ which evaluates various digital commerce platforms states that the leaders in 2018 are SAP, Oracle, Salesforce and Magento. Aldo also used SAP to help digitize its retail experience, making it easier for the shoe retailer to manage inventory online and in-store. Roots is another Canadian brand that has jumped on the cloud bandwagon, using Salesforce’s commerce cloud to help it redesign and refresh its website with a mobile-first approach. Cloud computing has been a growing market, being valued at $199 billion (all numbers are USD) in 2018 according to Statista. And the market is set to grow even more. According to that Statista report, Salesforce was the leading software-as-a-service (SaaS) vendor in the U.S. last year, controlling 9.6 per cent of the SaaS market and making up $110 billion of that almost $200 million dollar valuation.